An ECOWAS study Group of Ambassadors, Special Representatives, and Officials visited the International Criminal Court (ICC) in The Hague, Netherlands, on March 13, as part of a regional capacity building program on Negotiation and Mediation as Instruments for Conflict Resolution at the Clingendael Institute of International Relations. 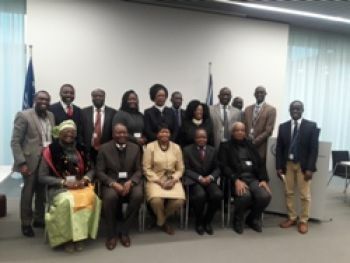 At the ICC, the relevant authorities made presentations on the history, structure, mandate of the court, the Trust Fund for Victims, the Registry, and the work of the office of the Prosecutor, according to a release from Abuja. The President of the Court, Justice Chile Eboe-Osuji, welcomed the group briefly and expressed how happy he was about the visit of the distinguished group of ECOWAS Delegates to the ICC. Also welcoming the Group, the Special Prosecutor, Madame Fatou Bensouda, and a National of ECOWAS told the Delegates she was very pleased about their visit because it fitted her office’s current outreach on information of the court to relevant stakeholders. She implored the ECOWAS Delegates to serve as advocates for the justice mission of the Court. “The pushback against the court is due to the negative perception about what the court does. We welcome debates, which must be devoid of political posturing,” she stressed. The Delegates, including Liberia’s Ambassador to Nigeria and ECOWAS, Prof. Al-Hassan Conteh and Madame Vabah Gayflor, the Special Representative of the ECOWAS President to The Gambia, discussed various strategies and proposals on how to get the word out about the mission and vision of the ICC. Other Members of the Delegates were Sierra Leone Ambassador H.E. Afsatu Olayinka Kabba, Togolese Ambassador, H.E. Lene Dimban, Nigerian Permanent Representative to ECOWAS, H.E. Babatunde Nurudeen Ayinla, Babacar Carlos Mbaye ECOWAS Resident Representative in Cote d’Ivoire, H.E. Lilian Alapini, ECOWAS Resident Representatives in Guinea. The Delegates equally included Dr. Brown Odigie, Program Officer on Capacity Building and Mediation at the ECOWAS Commission, Mr. Serigne Ka, Program Officer on Good Governance, Mr. John Elachi Agada of the Institute of Chattered Mediators and Conciliators, Ms Liliam Sowah, of the Ghana High Commission in Abuja, and Mr. Musa Kabiru, Counselor at the Nigerian Mission in The Hague. The Delegates were participants in the Seminar on “Negotiation and Mediation as an Instrument for Conflict Resolution” at the Clingendael Institute, The Hague, Netherlands, from 12 to 16 March 2018. Cligendael is a leading global think-thank and academy on international affairs that conducts policy oriented and analysis and research on strategic international issues. Clingendael and the ECOWAS Commission sponsored the seminar, the release concludes.